>> Check out our Easter Sales Coupons! << http://t5.w-ga.me/FcApri020bb ◀ Get your FREE COINS & Shopping with the Special Sale Coupons! Click LIKE & SHARE so your friends can check'em out! Robert. http://t5.w-ga.me/LwApri20xe ← Click to Spin Your Extra Lucky Wheel! Thank you for loving Take5 Slots! Each & every one of you deserves another Extra Lucky Wheel! Click LIKE & SHARE so your friends can enjoy too! Robert. 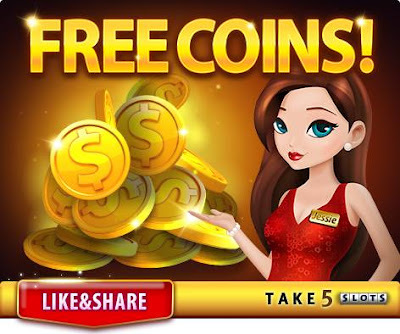 More Take5 fans wanted FREE COINS than Extra Lucky Wheel! As I promised, http://t5.w-ga.me/FcJApri020xe ◀ Claim "200,000" FREE COINS & PLAY NOW! Click LIKE & SHARE to let your friends enjoy the reward FREE COINS! Robert. >> Check out our Easter Sales Coupons! << http://t5.w-ga.me/FcApri019bb ◀ Get your FREE COINS & Shopping with the Special Sale Coupons! Click LIKE & SHARE so your friends can check'em out! Robert. http://t5.w-ga.me/FcApri19xew ◀ Free Coins! We always take care of the Take5 Family! Claim NOW & Good Luck Spinning! Click LIKE & SHARE to get your friends to join you. Robert. ★ "300" Jackpots Is Now on with 10 Hottest Slots ★ You still have time for a Jackpot! Don't hesitate & Spin Now! http://t5.w-ga.me/FcApri19xbd ◀ Claim your FREE COINS & compete for Huge Jackpots! Click LIKE & SHARE so your friends can enjoy too! Robert.